Every Oldsmobile model in 1930 was offered in three trim levels: Standard, Special and Deluxe. Each one was equipped with a 198-cubic-inch inline six-cylinder engine. 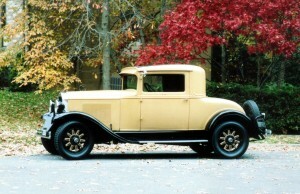 George Shepard calls his two-passenger Model F-30 coupe a “Plain Jane,” which would have been the Standard version that sold new for with a base price of $895. A total of 3,726 cars like Shepard’s were manufactured. The car survived the Great Depression and World War II, but where it resided is anybody’s guess. The earliest known record of the 1930 car was when it was registered in 1957 in Maine. The old Oldsmobile passed through a few owners before it was purchased in 1968 by a man who set about restoring the coupe. The well-executed task consumed four years. After 28 years, the Oldsmobile was put up for sale at the same time Shepard was searching for a closed antique car. At the time he had a 1920 Model T Ford phaeton that he says, “had air conditioning all year round.” He bought the Oldsmobile in the summer of 2000 in New England and the following year moved to Burke, Va. The 2,755-pound car made the trip south in a trailer. “This thing has a nice motor in it,” he says. But he doesn’t want to be the one the drive it to its top speed of 85 mph. The 5.50×16-inch four-ply tires are on demountable rims attached to 10-spoke wheels. Each wooden spoke is decorated with a diamond shape in black paint. A special tool Shepard carries in the trunk enables him to adjust the wheel rim so the tire can be removed in case of a punctured tire. The spare tire is mounted at the rear of the car, behind the gas tank, necessitating a split-rear bumper, on each side of the spare tire. Both rear bumpers are curved to wrap around the sides to protect the fenders. Another tool in the trunk is the familiar hand crank. Fortunately, the Oldsmobile has a self-starter that is activated by stepping on the starter button on the floor. In front of the radiator are 17 vertical shutters, which can be opened or closed by turning a hand control on the dashboard. The shutters ration the air drawn through the radiator by the four-blade fan. While the engine is developing 62 horsepower it is also throwing off a considerable amount of heat. Assisting in controlling heat from the engine are 27 vertical louvers on both sides of the engine hood. When the trunk is open the wood framing of the “Body by Fisher” is evident. The wood forms the skeleton that supports the metal body. At the hub of the four-spoke steering wheel is the horn button and two levers, the left one to adjust the throttle and the right one to illuminate the 9-inch diameter “Tilt ray” headlights, as well as the single taillight on the left fender. Inside the cozy cabin both the hand brake and the gearshift lever sprout from the floor. Synchromesh transmissions were not installed in Oldsmobiles until 1931. “You have to double clutch shifting up and going down,” Shepard explains. On the inside of the passenger’s door is a convenient pocket — the one and only storage area inside the car. A single wiper suspended from above the windshield keeps the glass directly in front of the driver clear. Shepard says his butterscotch-colored coupe has brown pin striping and a black fabric insert in the roof. All steel “turret tops” were still a few years in the future. The odometer now indicates 54,986 miles.